is on the lips of everyone around us. Cropping up in digital scrapbooking. On Facebook I see this word often. People use it to encourage others. So the answer to my question is NO it doesn't make sense on its own. It is dependant on something else with it so that we can have a proper understanding. Any time I sit and look at my plaque I am challenged to consider what I believe in, what words I would add. Now what would you rather have with it? What comes with the word believe is important, not just anything will do. We can't just glibly say we believe in any old thing now can we? 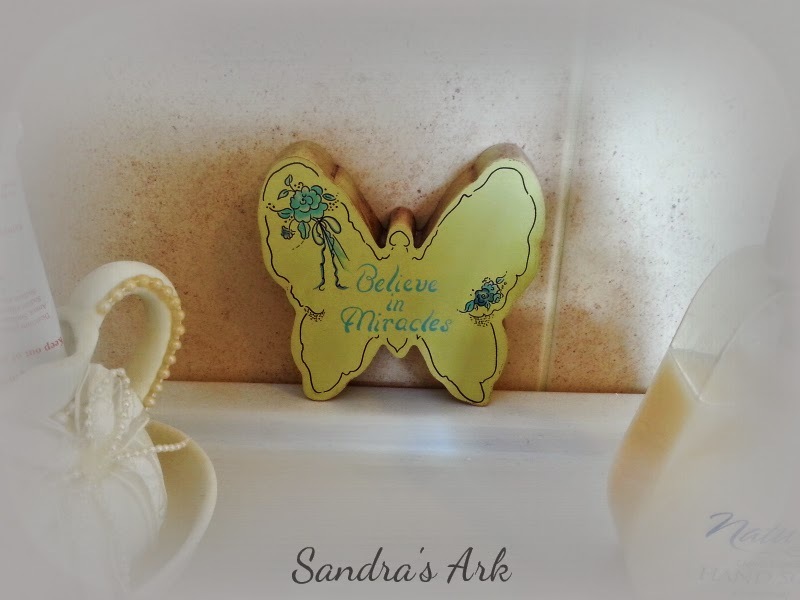 I also have a butterfly plaque in my ensuite which says Believe in Miracles. I know which of these I would rather choose to believe in. And I am happy & joyful that I know this. I want to encourage you today to think about what you really believe in, what you trust in and what you would stand up and be counted for. I'm glad I know who I believe in and that I can depend on Him and His Word. 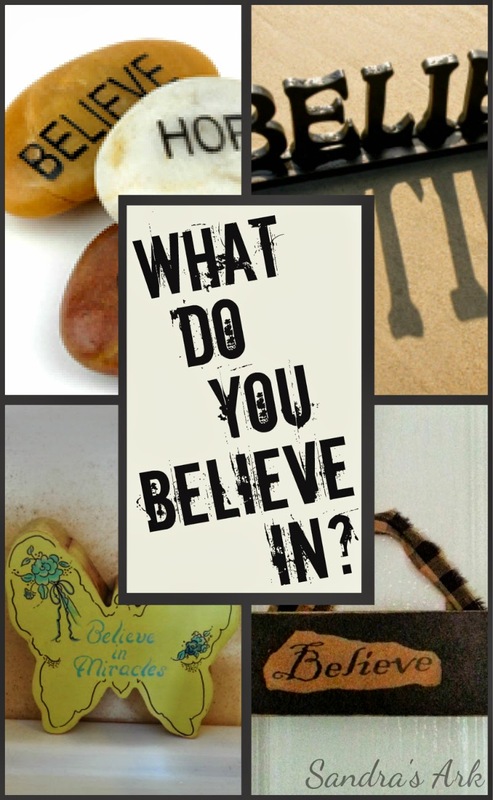 Labels: A Dose of Encouragement, believe, Bible, What do you believe in? I chose to believe in God and his unconditional love! Thanks for sharing! I loved how you put this all together! Very thought provoking! A very creative post. I believe that God is for us so who can be against us. Have a wonderful day! Live it! Too many people don't slow down enough to really think about what they believe in. This is very encouraging. I believe that everyone should take at least a few minutes each day to connect with their spirituality, faith, and what they believe in. Good thoughts. 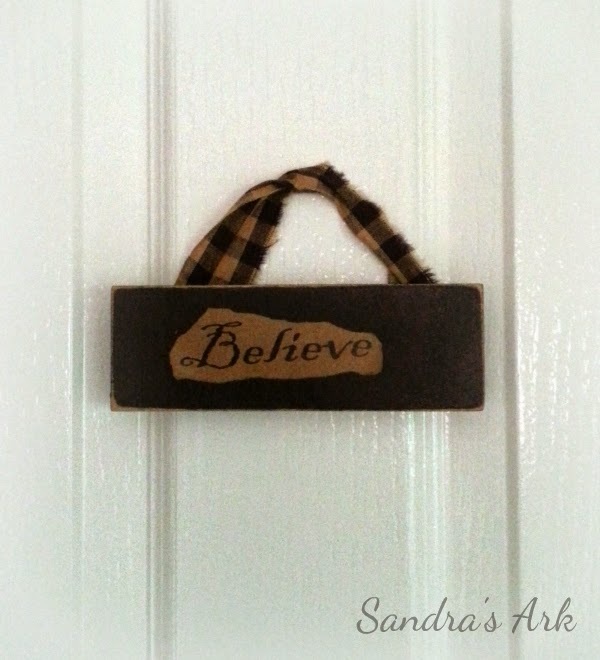 I often see plaques with the word "Believe" and you are so right, it could mean something different to many. Thankful I know Who I believe in and am grateful for His faithfulness. I believe in God and His endless love and grace for me. It bring me to my knees just thinking that He loves me that much! Blessed you linked up to The Weekend Brew. Beautiful! This was so much a part of the If:Gathering wknd... that message of Believe and Faith were so intertwined through out! Great reminder to be mindful and intentional of what (and Whom) we are Believing in! Amen. How often do we grab something because it looks cute or has the right colors for the room decor, yet we don't live the word, the thought? Thank you. Visiting from Inspire Me Monday and you have! Amen! Believing in God the Father, God the Son and God the Holy Spirit makes all the difference in my life :). You bring up a good point! I guess it's better to believe in something than nothing at all. Found you through the Bloggers Brag Party! I believe in Jesus Christ the Son of God the Father and the Holy Spirit Jesus sent to live inside us and to be our constant comforter. I trust and believe in God's Word the Bible and accept it as Truth. I believe in the eternal reward for those who accept Jesus as Savior and that His eternal life begins in me at the very moment I accept Jesus as my Lord. I loved all your believe plaques and thank you for sharing with us here at Tell me a Story. Great post, Sandra! I also 'believe in God the Father, Son and Holy Spirit and His Word, the Bible. Thank you for linking up at Women With Intention Wednesdays! My sweet Mother-in-law got me a necklace for my birthday last year that says "Believe." Every time I look at it, I am reminded about God's love and power-- which is definitely what I believe in. Thanks for this reminder, Sandra! I believe in God and Our Lord Jesus Christ and the Holy Spirit! I now God has given me years and years of free grace. He only asks for our love in return. One of our pastors has a tatoo on his forearm. It says FINISHED because he says, when he sees it, he knows Jesus already suffered for all our sins and we are free to accept his grace and mercies each day. When my mother was alive she always said "Pray hard and if that isn't working, pray harder! "My friend, sweet Jenny, made me a sign that says "Life is hard, Pray harder." Love your postings! Christian Songs for Kids - He's Alive!